With China’s first lady beaming beside him, Chinese Communist Party leader Xi Jinping emerged from his Boeing Air China jet and walked down the red carpet at Paine Field Airport in Washington state on Sept. 22. The clear Seattle sun stood in contrast to the cloud of disputes that has loomed over Xi’s weeklong state visit—a trip that China needs much more than the United States, according to analysts of China’s foreign policy. The Obama administration has blamed China for a round of cyberattacks aimed at American government agencies in June, and various massive incursions against businesses whose trade secrets have been pilfered. China’s aggressive island-building in contentious South China Sea waters has been a sore point for the United States—but the U.S. military has held off on an aggressive demonstration of freedom of navigation. And while Chinese security forces have engaged in a crippling crackdown on Chinese lawyers and activists who defend the downtrodden, U.S. officials have not turned human rights into a central issue in the relationship. Given how much the Chinese Communist Party needs the relationship to succeed, it’s unusual that the United States hasn’t exploited its leverage much more. “What China wants from the United States is much more than what the United States wants from China,” said Chen Kuide, the executive director of the Princeton China Initiative and chief editor of the publication China in Perspective, in a telephone interview. The communist regime “wants America to help with their development, and when they’re powerful enough, they’ll disrupt the global order,” he said. What China wants from the United States is much more than what the United States wants from China. “There are aspects of the Cold War” in the relationship. On the other hand, the Communist Party’s attempt to be conciliatory even as it provokes punishment seems to be working. And China, said Xi Jinping in a written interview with the Wall Street Journal on Sept. 22, “wishes to join hands” with America to tackle global issues. “Both history and reality show that China and the United States stand to gain from cooperation and lose from confrontation,” Xi added. This meme of cooperation no matter what appears to have stayed the hand of U.S. sanctions that would have struck directly and sharply at the Chinese companies that have been benefited from intellectual property stolen directly from U.S. companies, for example. “I’ve watched their games for over 20 years. The Americans are always getting tricked and taken advantage of,” said Wang Juntao, a prominent dissident and a scholar of the Communist Party, in a telephone interview. He was about to board a plane to Seattle to join the protests against Xi. “The Party is using a Maoist tactic of turning bad things into good things. It’s better for them to do something bad and then back off, than to do a good thing in the first place. If they always followed the law from the beginning, no one would say they’re good,” Wang said. This framing device exploited by the Party is often evident in Western discourse about China—for example, praising the progress of human rights in China compared to the chaotic and violent Cultural Revolution. The Communist Party is also often credited with China’s emergence from poverty in the last 40 years, imposed by policies implemented by the Communist Party. 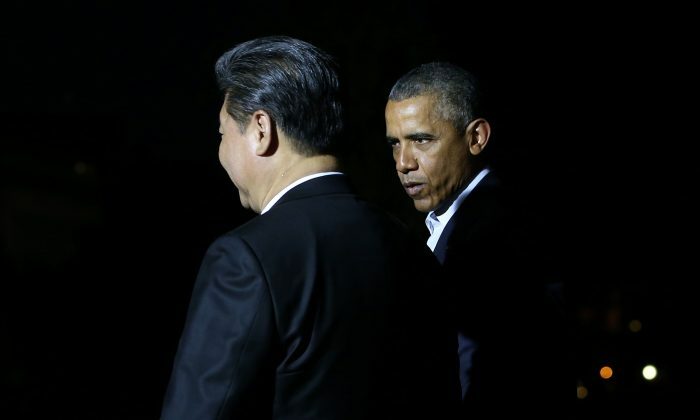 He added: “How could Xi Jinping really want to antagonize America? He wants to say things that are nice to America” in order to simultaneously continue a cooperative relationship while still pressing for China’s benefit at America’s expense. The Party’s head of security, Meng Jianzhu, flew to Washington, D.C., to engage in last minute talks with administration officials to head off any sanctions before the trip. A general framework on cybersecurity was outlined—but it didn’t address the core concerns America has, about the theft of intellectual property. In the dissident community, there is growing frustration at Obama administration’s light touch on human rights given the U.S.’s potential political leverage over the Communist Party. Gao Zhisheng, a well-known human rights lawyer, recently called for his wife, Geng He, who is based in California, to boycott a private meeting with a senior State Department official due to the administration’s general inaction on human rights and closeness with the Communist Party. “Xi’s leadership can’t bear anything going wrong during his grand visit to America,” wrote Chinese human rights lawyer Jiang Tianyong, according to a translation by China Change, a website that tracks China’s dissidents. Matthew Robertson contributed to this report. China is facing pressure on all fronts, internally and externally. The U.S. should not be afraid to stack on and gain concessions in its own interest.